Heidi Moksnes holds a BA degree in Social Anthropology and Development Studies at University of Gothenburg and obtained a PhD in Social Anthropology at the same university in 2003. She has been a researcher at the Collegium for Development Studies at Uppsala University and, between 2007 and 2014, at Uppsala Centre for Sustainable Development at Uppsala University. During that period she also lead, together with colleagues, the national research network DevNet: The Development Research Network on Nature, Poverty and Power (2008-2012), and the Sida-funded project Civil Society: Research and Practice in International Development Cooperation (2009-2013), organizing yearly international conferences and publications. 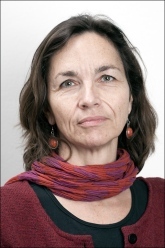 Since July 2014 she is Senior Lecturer of Social Anthropology at Stockholm University. Moksnes has an overall interest in the constitution of collective agency and notions of social and political selves in contexts of societal marginalization. Her research engage with issues such as identity politics, the globalization of the human rights discourse, political mobilization within civil society on local and global levels, especially among indigenous peoples and rural and urban poor, and cultural continuity and change among particularly highland Maya. Her current project, Living without Rights: Undocumented Migrants and the Boundaries of Citizenship, funded by Riksbankens Jubileumsfond, follows undocumented labor migrants from Latin America living and working in the Stockholm region in Sweden. The project investigates to what extent and how these migrants are able to constitute themselves as social and political participants in a Swedish society of which they are de-facto members but formally excluded from and highly vulnerable in. In two earlier individual research projects, both funded by Sida/Sarec, she has addressed the formation of politicized identities and claims by indigenous people in Mexico on rights, political participation, and effective citizenship. Her dissertation project focused on a group of Tzotzil-speaking Mayas who had affiliated themselves with the liberation-theological Catholic diocese of the region. The project resulted in a PhD dissertation in 2003 with the title Mayan Suffering, Mayan Rights: Faith and Citizenship among Catholic Tzotziles in Highland Chiapas, Mexico, and several internationally published articles and book chapters. The ensuing project focused on indigenous peasants migrating to the urban area, and how they created socio-political-economic networks that offer mutual support and means to access citizenship rights. For these two projects, she conducted fieldwork among rural and urban Maya in Highland Chiapas for more than 20 months, as well as at the United Nations to study the formation of a global politicized indigenous identity. The principal publication of both projects is the monograph Maya Exodus: Indigenous Struggle for Citizenship in Chiapas (University of Oklahoma Press, 2012). "Papperslösa arbetare och möjligheterna för facklig organisering,” in Irreguljär migration i Sverige: Rättigheter, vardagserfarenheter, motstånd och statliga kategoriseringar, ed. by Maja Sager, Helena Holgersson and Klara Öberg. Göteborg: Daidalos. Claiming the City: Civil Society Mobilisation by the Urban Poor. Heidi Moksnes and Mia Melin (eds), Uppsala: Uppsala University. “Introduction,” in Heidi Moksnes and Mia Melin (eds), Claiming the City: Civil Society Mobilisation by the Urban Poor. Uppsala University, Uppsala, pp. 3-13. Faith in Civil Society: Religious Actors as Drivers of Change. Heidi Moksnes and Mia Melin (eds), Uppsala: Uppsala University. (with Eva Christina Nilsson) “Introduction,” in Heidi Moksnes and Mia Melin (eds), Faith in Civil Society: Religious Actors as Drivers of Change. Uppsala University, Uppsala, pp 3-7. Maya Exodus: Indigenous Struggle for Citizenship in Chiapas. University of Oklahoma Press, Norman. Global Civil Society: Shifting Powers in a Shifting World. Heidi Moksnes and Mia Melin (eds), Uppsala: Uppsala University. (with Håkan Thörn) “Global civil society – beyond the ‘good’ and the ‘bad’,” in Heidi Moksnes and Mia Melin (eds), Global Civil Society: Shifting Powers in a Shifting World. Uppsala University, Uppsala, pp 3-7. “Independence or Clientilism? Negotiating Indigenous Autonomy in the Urban Setting,” in Independence and Dependence in Latin America, 200 years later. Stockholm: Institute of Latin American Studies. Power to the People? (Con-)Tested Civil society in Search of Democracy. Heidi Moksnes and Mia Melin (eds), Uppsala: Uppsala University. “Introduction,” in Heidi Moksnes and Mia Melin (eds), Power to the People? (Con-)Tested Civil society in Search of Democracy. Uppsala University, Uppsala, pp. 2-10. “A Human Rights Perspective: Are Some Rights More Important? Introduction,” in Ingrid Karlsson (ed. ), Meeting Global Challenges in Research Cooperation. Utsikt mot utveckling, Uppsala, Vol. 32, pp. 155-161.
Review of “Mayan Voices for Human Rights: Displaced Catholics in Highland Chiapas” by Christine Kovic, University of Texas Press (2005), in Journal of Latin American Studies, Vol. 40, No. 1, pp. 171-173. “Suffering for Justice in Chiapas: Religion and the Globalization of Ethnic Identity,” Journal of Peasant Studies, Vol. 32, Nos. 3&4, July/October, pp. 587-607. “Militarized Democracies: The Neoliberal Mexican State and the Chiapas Uprising,” Social Analysis, Vol. 48, Issue 1, Spring, pp. 116-125. “Factionalism and Counterinsurgency in Chiapas: Contextualizing the Acteal Massacre,” Revista Europea de Estudios Latinoamericanos y del Caribe/European Review of Latin American and Caribbean Studies, No. 75, April, pp. 109-117. Mayan Suffering, Mayan Rights: Faith and Citizenship among Catholic Tzotziles in Highland Chiapas, Mexico. PhD Dissertation, Göteborg University. Review of “La otra palabra: mujeres y violencia en Chiapas, antes y despues de Acteal,” coordinated by Rosalva Aida Hernandez Castillo, CIESAS (1998), in Hispanic American Historical Review, 80:1, February, pp. 195-196.